Closed Circuit Television is an increasingly powerful tool in many security applications – whether deterring town-centre crime, monitoring remote premises, providing evidence for criminal prosecution or for covert surveillance of terrorist and smuggling operations, CCTV increases coverage, provides evidence and cuts manpower costs. For large sites, remote monitoring and perimeter defences, cabling can become a real problem – typical methods of getting pictures from a remote camera to observation point involve trench-digging, laying fibre-optic or copper cables, or microwave and even leased-line connections – all of which have associated limitations and costs. Digging trenches for fibre is slow and expensive, taking weeks or months to complete. Conversely, Wireless is fast and easy to install, with typically two radio units to install at each end location, taking a few hours. Wireless is far more flexible also: if requirements change, the radio units can be moved and re-installed to other locations to give coverage as needed. 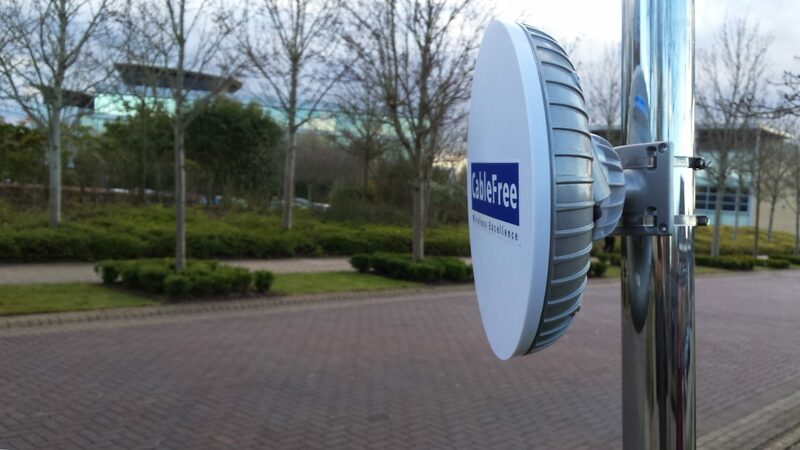 CableFree solves the problem with high-capacity, highly reliable wireless solutions with low cost of ownership. CableFree products offer up to hundreds of cameras with Gigabit capacity links which are installed in hours, not weeks. CableFree products are field-proven, with thousands of deployments in over 80 countries since 1997. Excellence in performance and reliability are not sacrificed in providing highly competitive priced solutions together with a comprehensive range of support services.